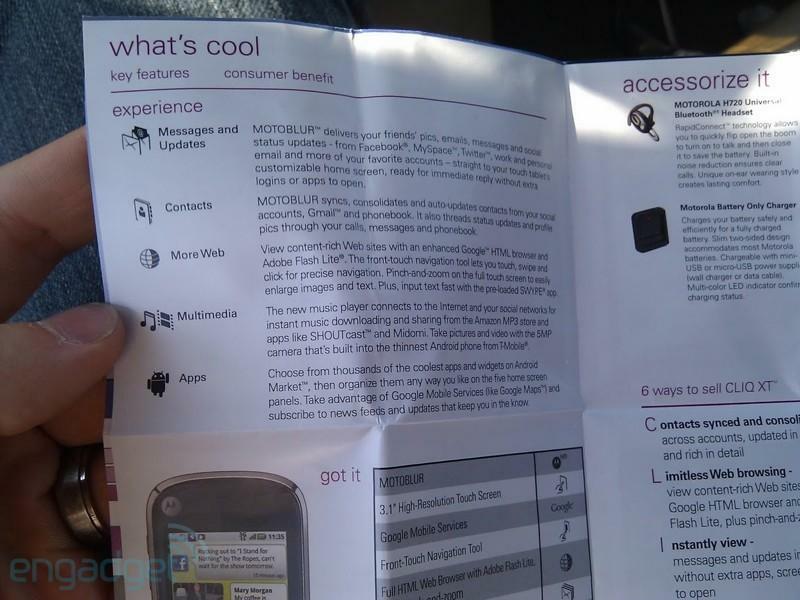 When Motorola rolled out the Cliq back in October, a sales pamphlet was one of the first things to show up in the wild after the announcement. 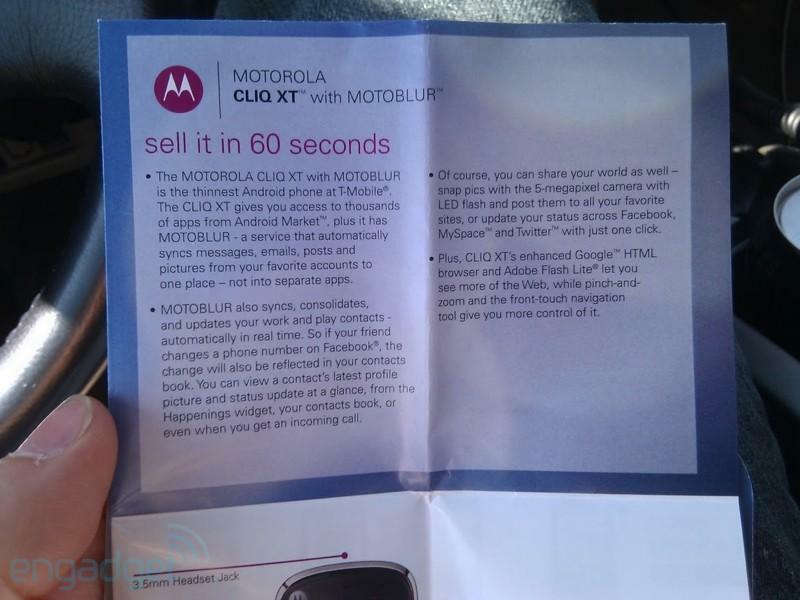 Motorola has released yet another sales guide allowing T-Mobile employees an opportunity sell the Cliq XT in 60 seconds. While that’s a pretty tall order for any salesperson, Motorola is breaking down the highlights of the Cliq XT’s features and giving you all the reasons to buy. Of course, if the pinch-and-zoom navigation, a 5-megapixel camera and MotoBlur don’t do it for you, you should probably be looking elsewhere for a phone. Engadget managed to get their hands on the whole pamphlet and, since they agree it should take 60 seconds to read through all the pictures, let us know in the comments if you are sold or not? Hit the jump for more pics! ← The HD2 Release Date Game Continues, Coming March 23rd? I can’t wait 2 get this phone!!!!!!!!! I love my current Cliq, but it is way too thick for me. This is the perfect form factor. I know a lot of people are underwhelmed by this device, but to me it fixes everything about the original Cliq I didn’t like- no flash and the thickness. Really, if you compare it to the other offerings on T-Mobile, it is one of the higher spec Android devices, and I’m sure 2.1 is coming to it eventually. Moto’s website for the XT claims it has turn-by -turn GPS, so let’s see, hopefully that is correct. Yeah I agree, this is a fantastic phone for the price point. I can’t understand why some people say it is a piece of garbage, all you have to do is read the specs. 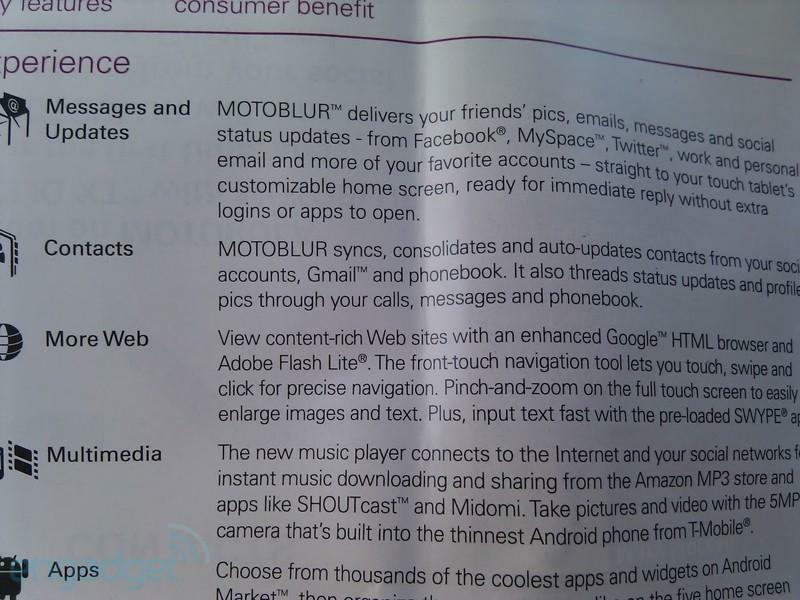 Flash, pinch zoom, 5mp camera w/flash, the thinnest android out there, long battery, motoblur…well, you get the picture. And the price? You can’t beat it! Best Buy will have it for $69.99 on upgrade!! I will probably get this to teplace my G1. I cqan quickly get used to no physical keyboard. This is not much of a step up from the G1. Rooted, the G1 is faster and can tether free of charge. Not to mention a real KB. Bothe will suffer the same fate of no Flash 10.1, but I have an N900 for that. ….but why, OH WHY Android 1.5?? None of these manufacturers are under any obligation to update their phone OS, except for some bug fixing if they ever want to sell them, so how does one choose? It’s like selling XP with a different theme, or maybe in this case Windows 95. But that pamphlet says it has “Adobe Flash Light(R)”? It does have adobe flash lite. There is a youtube video showing it. It is cool. Also, it it getting upgraded to android 2.1 in early April so it is actually way better than the G1. It has pinch zoom, 5mp camera with flash, and a bunch more cool stuff. For the price, it is a good deal. I had the chance to play with this phone all day yesterday and I really like it. I have an unlocked Iphone now and have been wanting to get rid of it for an android phone and this is def. the one. I feel it is a huge improvement over the Cliq(1st Gen), although not much of an improvement on paper. But I was surely sold yesterday. The keyboard was great and very responsive to the touch. I’m getting the HD2. Won’t be getting the Cliq XT even though it’s a decent phone. HD2 = Gorgeousness Maximus. WOOHOO!!!!! GROSS NAILS! GET A MANICURE! FYI, just called a TMO store — they say it’s set to launch on 3/17 (“…but that could change”). and FYI, I just called my local Maggy Store and they said 3/24 for $199 subsidized. I wish it would come out on the 17th though. The Wait is Excrutiating. Oh wait, I thought I was in the HD2 thread. HAAA!!! I pwned myself. HAAA!!!! 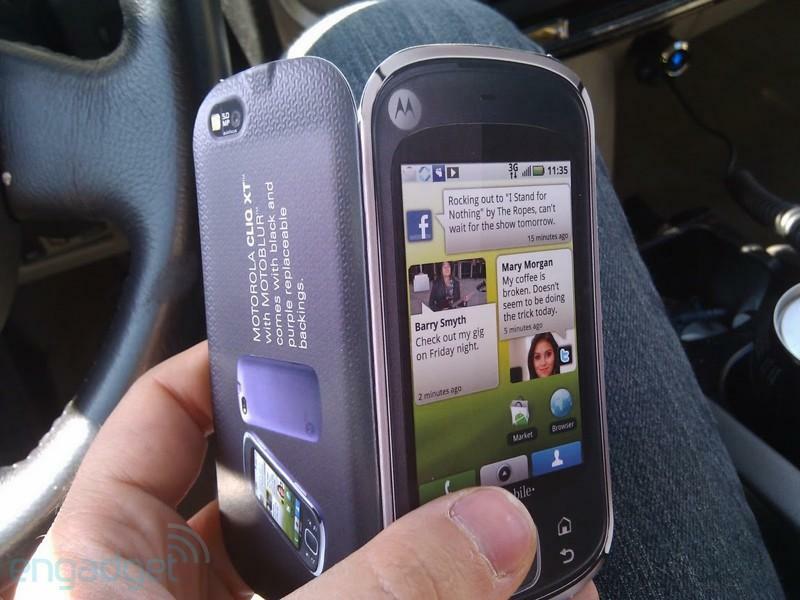 I jus called my local T-Mobile Store & the release date for the Motorola Cliq XT is tomorrow, March 10th 2010!!!!! I needed a new phone 3 months ago, pushing the released date back (17th) is not helpin me @ all!!!! T-Mobile needs 2 hurry up!!!!!!!!!!! Simmer down there youngster….just simmer down. It will launch when it launches. The cliqxt will be released on the 17th. Unfortunantly not tomorrow, but thankfully not the 24th ;) I cannot wait! I’m so excited!!!!!! Where is everybody getting this info from that Cliq XT is being released on the 17th? March 17th is the release date of the nokia Nuron, tomorrow, the 10th, is the Cliq XT! TMobile, I called a few stores; some say tomorrow, sum say da 17th & sum as well as customer service. Say their system says the release date TBD (to be determined) idk what 2 think! Guess I’ll just have 2 wait til tomorrow 2 find out!!! Actually found from my manager that it has been pushed back to the 17th!! Aww man….. do u kno y? I have a cliq (with a 3.1″ touch screen). I have to say it is near IMPOSSIBLE to type on the virtual keyboard. i can’t imagine having a cliq without a physical keyboard. 3.1″ screen is just simply too small to be a practical touch only android device. nvmd just saw it has swype. good thing. swype is pretty cool. using beta now.